Following the Departure of Uli Stielike the KFA, to everyone’s surprise, picked Shin Taeyong. For some STY was the obvious choice given his familiarity with the players and his “successes” with the youth NTs. For others the permanent appointment of STY heralded disaster especially with Hong Myungbo’s experience fresh in their minds. Since later posts will cover STY’s games thus far as the senior KNT manager, this latest edition of 17 for 2017 will review some of the controversies that arose as STY was appointed. STY is one of those rare individuals who turn out to be both a good player and a manager. A club legend at Seongnam and a KNT semi-regular, he turned to management immediately after retirement and eventually led Seongnam to an Asian Champions League trophy (+ FA Cup). As an employee of the KFA he was caretaker manager of the KNT, where he defeated Venezuela and lost 1-0 to Uruguay (but in ~style~). He then went on to manage the U23’s in the 2016 Rio Olympics and the U20’s in the U20 WC Korea hosted, in both cases making it past rather difficult group stages. Without a doubt, he is one of the most accomplished Asian managers out there. His exciting attacking style is also a major crowd-pleaser (when it’s there that is). Both tournaments [Olympics + U20] showed the best and worst of Shin. Everyone knows this is a man who likes his teams to attack. When it works, it works well and can be exciting for fans and players alike. But he has a tendency to experiment with selections and formations even ahead of big games. The feeling in some quarters is that he can get carried away with his own cleverness at times. 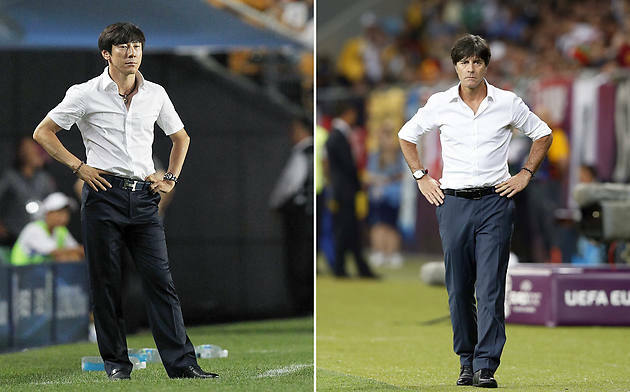 And his teams are not known for their defensive prowess, and issues at the back have hurt Korea in recent months. John Duerden does have a point with the getting “carried away with his own cleverness” part. In an interview after his ACL win STY mentioned how he was a very arrogant and overconfident player, and concluded that because he won the ACL perhaps he really WAS that good. I remember in the run up to the Olympics (and even recently as well) it was rare for STY to field two identical starting XI’s in a row. The starting XI doesn’t fully tell the story but it proves the point that he messes around with the team’s formation more frequently than even CKR did, even though I think the last time STY scored a major tactical victory was against Uruguay in 2011, where the 3-4-3 actually worked REALLY well. Hence our nickname for him, the Tinkerman. And this tinkering, in my opinion, may cost us some games, most notably at the U20 World Cup where a bizarre and uncharacteristically static 5-3-2 conceded 1st place in the group to England, and an unfamiliar 4-4-2 against Portugal led to us getting completely outclassed. So the anti-STY camp not only brought up his potential tinkering (and weakening) of an already frail NT, but also the chance that he would get the HMB treatment even with the expectations as low as they are. Things got really crazy once a source close to Guus Hiddink came out with comments alleging that Kim Hogon completely buried his request to coach the NT, and the KNT fanbase became the most polarized it has been since the “is-PJY-good-enough” case a few years years back. But that’s another case for another 17 for 2017 post. Considering the diversity of opinions on STY’s tenure so far, let us know what you’ve thought of him so far down in the comments!